I was inspired by this month's "Craft Book Month" theme over at Crafts Buds to make something from a book I received for my birthday a few months ago. I love this book: Bags: The Modern Classics by Sue Kim. It has so many simple patterns for nice bags, wristlets, totes, etc. A lot of the shapes inside are quite simple; it might be easy enough for a seasoned bag maker to figure them out on one's own - but for me, if there's a pattern available, I would much rather take advantage of someone else's hard work. I chose to make the clutch on the cover. I would die for a half yard of that Echino leopard spot (!) - it's a gorgeous clutch, but since I don't have that print, I went ahead and used some of my Lark stash. I love the ikat print - I thought I would hate it when I saw it online, but it's actually my favorite print from that collection. ANYWAY- this project could easily be done in an evening if you had no interruptions - it's a very simple bag. I enjoyed making it and I am pleased with the results! I love craft books - the inspiration and eye candy is so fun to browse. I usually check out craft books from the library before I even consider purchasing them. I am very picky about what craft books I actually own because I want to actually use them and not just clutter a bookshelf. In fact, I have done a project out of almost all of the crafty books I own. 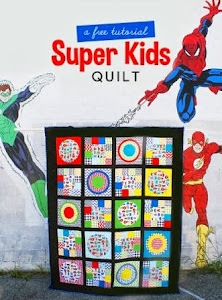 I love a lot of the newer quilt books that have been coming out lately - but I prefer the ones that just have patterns for actual quilts. I think it's kind of an annoying trend that quilt books often have odd projects - like a quilted cuckoo clock and how many quilted laptop/e-reader patterns does the world need?! There, that's my rant for today. I forgot to post a picture of the awesome tag I bought at Fancy Tiger Crafts in Denver. What do you think? Would you put these on any handmade items you gave to friends or family? This weekend I decided to tackle a pretty old UFO. A while ago, I had the crazy intention of making an entirely hand-pieced hexagon quilt and frame them in charcoal grey. It wasn't long before I realized that it was very time-consuming, but I didn't hardly love the look of it. I made myself finish 7 "flowers" and had the idea to applique it onto a large piece of fabric. It would've come out neater if I had hand-sewed all of the flowers to each other and then appliqued it to the background fabric but I just didn't want to put even more time into the project. I am happy with my results despite my initial lack of enthusiasm for the whole project. Once this is quilted and bound, it will be a nice gift to have on hand for someone special. I still have quite a few completed hexagonal flowers without grey borders that I have a plans for, stay tuned! I just returned from an exhausting but fun trip to Colorado to visit some family and friends. My mom came along and I brought my six month old daughter. I hadn't realized how badly I really needed a break from the daily routine - so refreshing to have some "time off." We did a little site-seeing, visited friends and family, ate out a lot (hello Cafe Rio! x3! ), and enjoyed the constant sunshine. All of the fabrics came from stash, and I did an improv-style backing. I am very happy with the way it came out. For the front, I love the use of blenders that aren't all dots. The monkey print from Ann Kelle is to die for. 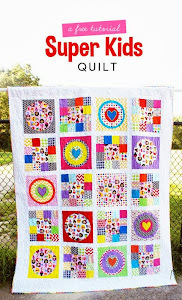 I bound the quilt in a Jennifer Paganelli dot - a perfect basic. I did a new-to-me free motion squiggle design. The quilt measures 54 x 63. I also made a stop on Ft. Carson to visit one of my first freshman year roommates, Melinda. She has three little ones, so of course, I pulled out my favorite stand-by children's gift: peg bears. You know the fabric obsession runs deep when you seek out local fabric stores when you are traveling. A few places had the whole range of Chicopee and I saw some Out to Sea and Field Study (the three collections calling my name lately!) but I decided to grab things that weren't so readily available online. I am thrilled with the Sarah Jane family tree panel, and I am really tickled to have the other three in the top row- I especially have wanted some of those foxes for forever! The cuckoo clock print is a lot of fun too. I could be wrong, but I kind of think that sewing and quilting is bigger out West. There seem to be more shops and a lot of them offer long-arm rental (something pretty rare in my area). I was pretty excited to come across a great sale at one store - lots of good basics, Amy Butler Love, and Meadowsweet at 50% off. Stores around here seem to have bolts on their shelves for ages and never lower the price..... Can you tell I am a little sad to be back?